Sandra attended the first one year Women into technology metalcraft course held at Swindon College by Melissa Cole and obtained a Blacksmithing National Diploma. She then joined the Guild of Wrought Ironwork Craftsmen of Wessex, attended their regular forgework weekend courses at Cannington College, and was secretary of the Guild for five years. Sandra was accepted for a rural apprenticeship New Entrants Training Scheme held at the National School of Blacksmithing in Hereford. Under the guidance of Paul Allen FWCB LWCB LCGI, a specialist in pure forgework techniques, Sandra obtained a certificate of training by the Countryside Agency as well as a certificate of competence from the Worshipful Company of Blacksmiths, an ancient London Guild incorporated in 1325. 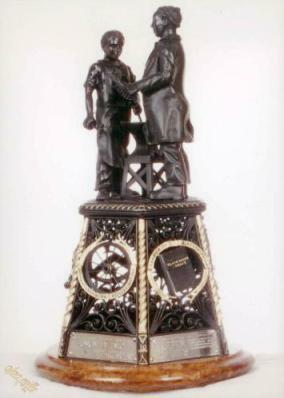 In 2003 Sandra Barrett became the first lady blacksmith in Britain to be awarded the Frank Day Perpetual Trophy in the blacksmith craft for forging metal in the traditional manner. 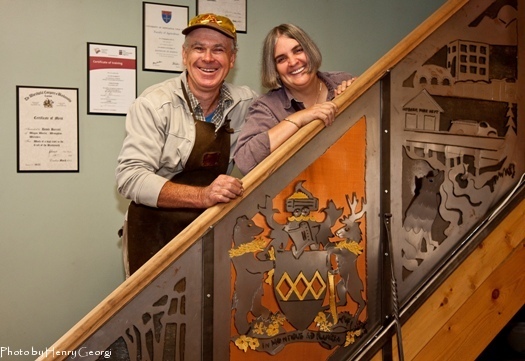 Sandra is currently a member of and librarian for the Kootenay Blacksmiths’ Association in Canada, a professional member of the British Artist Blacksmiths Association and a member of the Artist-Blacksmith’s Association of North America. David obtained a degree in Engineering from Newcastle University and has had 30 years of worldwide experience in manufacturing and contracting. He also attended the National Scool of Blacksmithing under Paul Allen and obtained a certificate of training by the Countryside Agency and a certificate of merit from the Worshipful Company of Blacksmiths. David took over his family business Barrett’s of Wroughton, established in 1893, on his father’s retirement in 1993. Since then David and Sandra have worked together as a husband and wife team. They moved from Britain to Canada, relocating machinery and equipment to Fernie Forge, a purpose built forge which opened for business in 2005. David’s engineering skills combined with Sandra’s artistic flair ensures that customers’ wishes become a reality on time and within budget. Their professional development continues with attendance at ABANA , KBA and CanIron events, organisations in the United States and Canada which promote blacksmithing through conferences and demonstrations.